Boasting over 144 islands, this playground on the northeastern tip of New Zealand called to us from the moment we set foot in Northland. 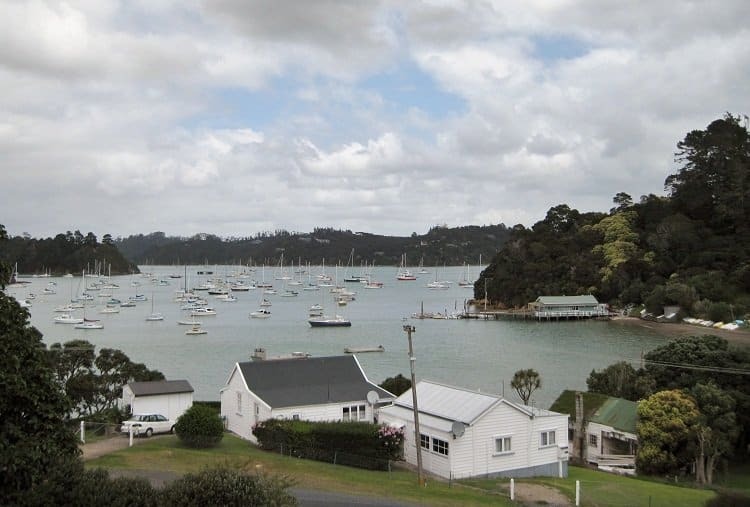 After several days in Whangarei and the west we drove to the resort town of Paihia, a hub for the Bay of Islands. Paihia offers a range of accommodation and we noticed many vacancy signs as we drove through town, despite the fact that we were visiting in high season. We made our way to the lovely bed and breakfast we’d booked and were greeted by our warm hosts Lynda and Roger. The Bay of Islands has many small Mediterranean-style beaches like this one. 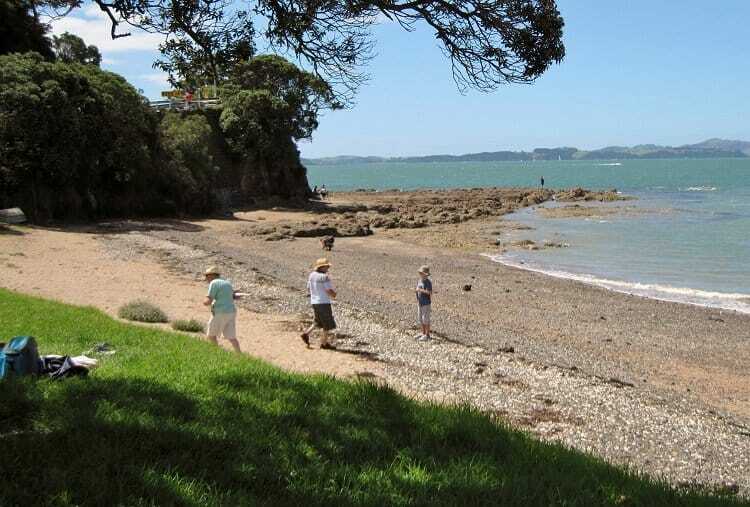 Visitors to Paihia will be tempted by cruises, swim with dolphins excursions and coach tours to Cape Reinga and the sand dunes of 90 Mile Beach. Others come to enjoy sailing, kayaking, jet skis, skydiving and other aquatic pursuits. We elected to participate in none of these. Our first two weeks of travel have taken us over budget thanks to poor planning and the public holidays. Instead we chose to relax and explore on our own, saving our money for planned excursions down the track. Sailing is popular in The Bay of Islands. 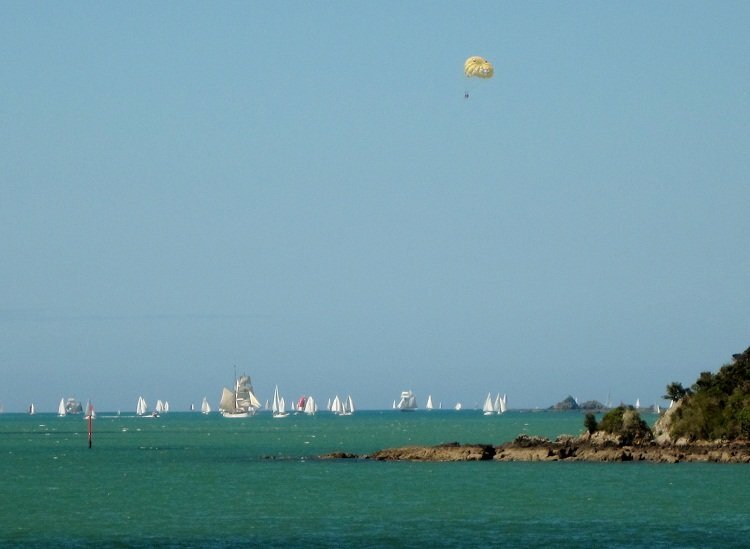 On the day we arrived we saw the Tall Ships Race from across the bay. But we did enjoy a very fun four days here. We took the passenger ferry to the charming historic town of Russell on our first day out. One would never guess that such a romantic spot was once a destination for rambunctious traders and drunken sailors on shore leave, earning it the nickname “the hell hole of the Pacific.” Today Russell is a quaint and quiet holiday place filled with restaurants, cafes and beautiful places to stay. We were keen to pop in and visit some friends we had met on our honeymoon in the Whitsunday Islands. David and Brad run the fabulous and popular (too popular for our last-minute selves) luxury bed and breakfast, Arcadia Lodge. Overlooking the Matauwhi Bay, this landmark house has amazing views and commands attention from its hillside location. We ran into David on his way into town on his bicycle and made a plan to meet up at the house for a coffee and a chat. 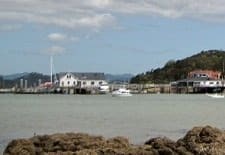 After a great catch-up on the balcony, we headed back down to town for a pint at New Zealand’s first licensed hotel before returning to Paihia on the ferry. The view from Russell's landmark Arcadia Lodge. We're lucky enough to know the owners who invited us up to check out their beautiful property, which has been lovingly decorated. If you're looking for a romantic retreat, this is the spot. The following day we drove up to Kerikeri, another historic town to the north. We were after a foodie day and weren’t disappointed. Larger than Paihia, Kerikeri features an array of restaurants, shops, cafes, wineries, orchards and craft shops. This is where we would go to source fresh produce if we lived in the region (The Bay of Islands Farmer’s Market trades on Hobson Avenue every Sunday morning). Northland produces a wide range of citrus and tropical fruits, macadamia nuts, avocados, guavas, bananas, passionfruit, pineapples, figs and mandarins. Everywhere we looked we saw signs advertising fruits, vegetables and agricultural products. 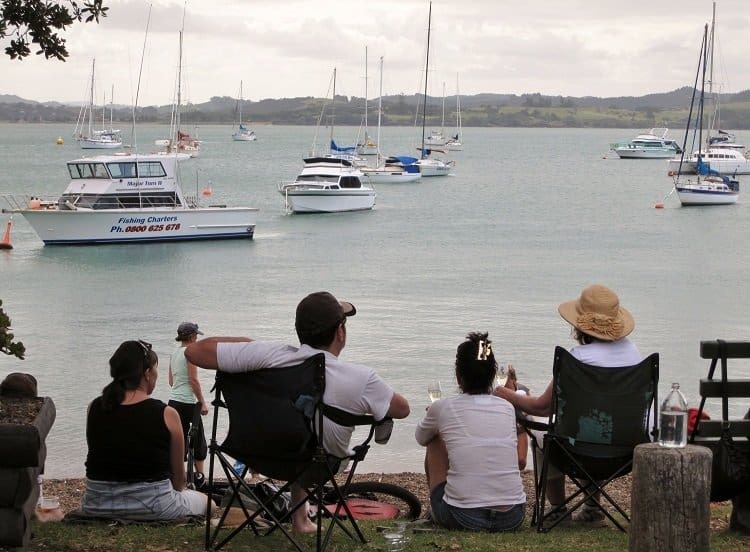 People enjoying a lazy Sunday afternoon along the foreshore in Russell. 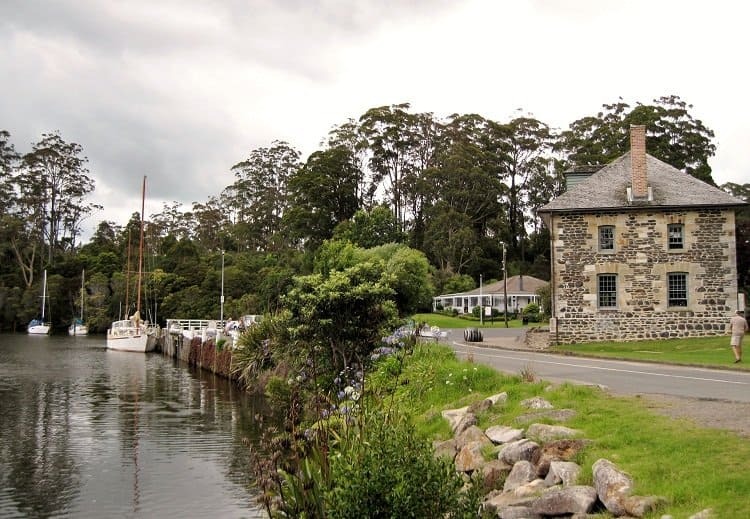 We began our explorations in the Kerikeri Basin where the historic sites and buildings are located along Puketotara Stream. New Zealand’s oldest surviving building, the Kerikeri Mission House is located here. Visitors can also see Rewa’s Village, which is a replica of a typical pre-European Maori village. We then moved on to the Makana Chocolate Factory where we were greeted on arrival with some delicious samples. After that it was on to Get Fudged for some freshly made fudge and a huge selection of classic lollies. I don’t think I’ve ever seen so many flavours of fudge in one shop! Kerikeri's town basin is home to several historic buildings. Wineries were the highlight of the day for us. John chose three to visit, starting at Marsden Estate. After tasting their wide selection we had a yummy lunch under the vines on their terrace overlooking the vineyard and pond. The food was delicious and reasonably priced for a winery, and we also picked up a bottle of their 2006 Pinotage to take with us. We then took a short drive to the Fat Pig - how could we miss visiting a winery with that name? The owners here grow Syrah, Chardonnay, Pinot Gris and Sauvignon Blanc, which are typical of the region. Not only did we enjoy our tasting (the wines are as delightful as the clever branding and signage at the cellar door), but we also had a nice chat with Bruce and his wife and got to play with their two Labradors. And yes, they do have a pig on premises. John went right up and gave the huge, pink and aptly named, Jenny Craig a pat on the head. 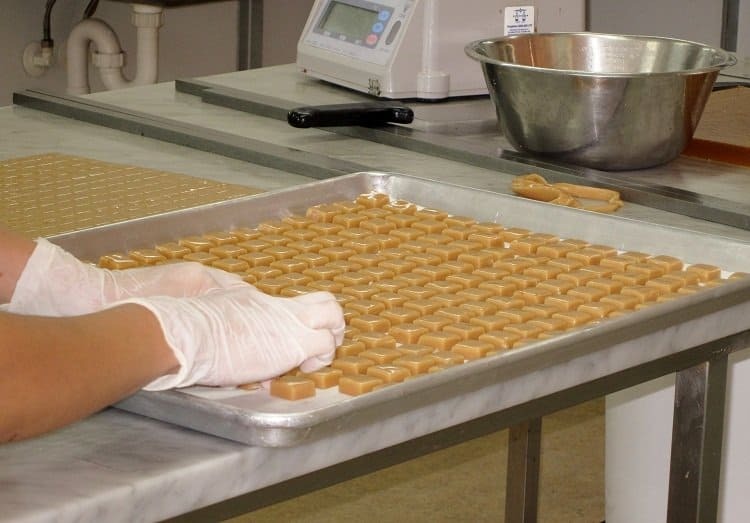 A must-try in Kerikeri are the handmade confections at Makana Chocolate Factory. Finally, we reached Cottle Hill Winery, which was founded by Mike and Barb Webb. This friendly American couple from San Diego sailed their 35ft yacht to New Zealand and never looked back, opening this fantastic small, family owned winery. You could feel Mike’s passion for great wine as he asked us what we liked to drink and suggested some tastings for us. Cottle Hill does a brilliant Sauvignon Blanc and we were excited to see that they also create Italian-style grappa. Unfortunately we didn’t get to taste their Dolcetto or Pinot Noir because they were already sold out. Instead we picked up a 2006 Syrah and a bottle of Golden Grappa. 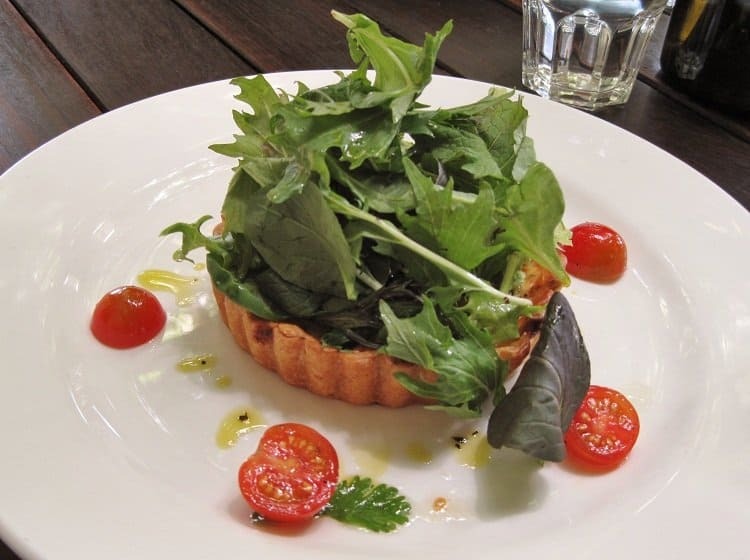 The French Onion Tart at Marsden Estate's terrace restaurant. Our last stop of the day before heading back to our B&B was to the small Mahoe Farm in Oromahoe for some organic cheeses. This small cheesery produces Gouda, Edam, Belrose, blue cheese and washed rind from what we could see and we picked up a Cumin Gouda and Belrose to take home. As I write this, we are enjoying our cheeses and wine from our balcony and enjoying the water views. Just another delicious, relaxing day in the Bay of Islands. John enjoyed a Vietnamese Beef Salad at the Marsden Estate winery. Definitely adding the Bay of Islands to my travel list, if not just for the food and wine! Sounds delicious! It is really nice up there…so much to see. I’d love to do some sailing up there if we go again. If you guys are into trees, west from there, there’s this forest called Waipoua, and they have the biggest/tallest Kauri tree (they have names: Tane Mahuta and Te Matua Ngahere). Looks like you guys are having a great time there. 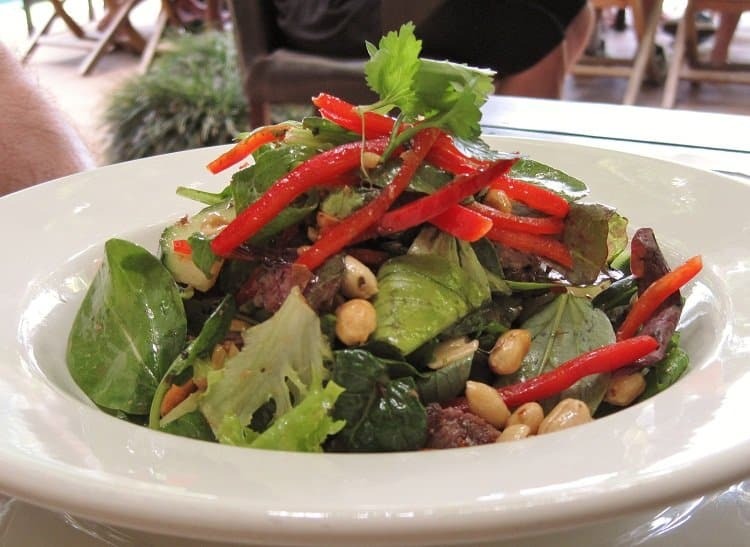 The beef salad looks so delicious, and since I don’t have my lunch yet, it’s mouth watering! I wish we had the time to go to Bay of Islands, I really wanted to see the Hole in the Rock. Have you guys seen it? I guess we just have to keep it for next time going back to NZ. We didn’t because it looked similar to Etretat in France, which we have been to. I did want to swim with dolphins though…tours so expensive! wow new Zealand is so beautiful by the water. I’m excited by your photos and hope to visit in the future.